Located at the outskirts of the city, it is an artists’ colony set amidst Ifugao and Kalinga huts. Getting there may be a little tricky but certainly well worth the trip. A minimal entrance fee gets visitors inside the compound to explore the grounds, which includes an art gallery and a coffee shop. 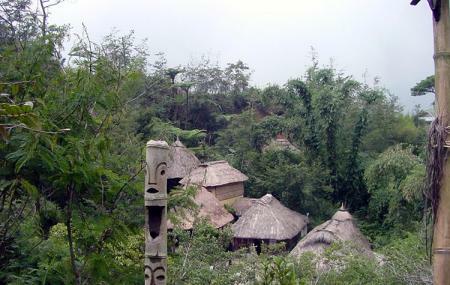 The different native huts and other areas are used for workshops and exhibits. It is the best place to purchase an artwork by one of the many talented artists who have their creations on display. A spectacular view awaits those who climb up to the highest point of this village. The main attraction in Tam-Awan Village is the cultural shows in which young Igorots showcase their talents on dancing using gangza. How popular is Tam - Awan Village? People normally club together Bencab Museum and Asin Sulphuric Swimming Pools while planning their visit to Tam - Awan Village. Well preserved place of history and culture to know what Baguio City really is about. The place is a bit steep and high, so if planning of going, it is better to wear comfortable clothes to fully enjoy the place and tour. A must visit here in Baguio. A little far from the city but you will be amazed with this place. You can have snacks here because they have a cafeteria. On our next visit, we will try to stay here because they are offering and accomodation. Tam-awan Village really made sure Baguio's culture will be showcased in the most authentic possible way. However, guests are not "warned" of the steep trek going to the viewpoint. There were no signs around the place how many more meters/steps to finish the trail. Overall, will still recommend to teens or adult tourists but not kids and seniors. Awesome historical place. Must visit. Do take the guided tour. Closes like 6 pm in the evening. So plan better. So perfect when you need some me time... Walking through the paths and discovering branched ways along the way for me is the best feeling... I find it meditating and don't forget to walk through the area with mirrors! It takes about 2 hours if you are alone and wants to discover the place by yourself... Quite difficult to reach thru public transport due to limited jeepneys so taxi is better.